Energy drinks are designed to give individuals a big boost to their energy levels. Athletes may feel that it helps their performance and students often use these drinks to pull all-nighters before a big test. However, Rock Star, Full Throttle, Red Bull and Monster energy drink side effects may outweigh the boost available from these beverages. Common and relatively mild energy drink side effects may include nausea, increased urination, diarrhea and headaches. Serious side effects of energy drinks can include seizures, heart palpitations and even death. If you experience any of these side effects, you should stop consuming the drink and avoid any other caffeinated beverages until you feel better. Consume plenty of water after drinking an energy drink, as the high levels of caffeine may cause dehydration. Many of these side effects are connected to the ingredients present in the drink and the amount of each ingredient that has been consumed. Read the product label for a better idea of the risks of each particular drink. Consuming more than 100mg of B6 may cause problems with the sensory nerves. Over 3000mg of Niacin (B3) can cause liver toxicity. Diabetics should be especially careful about consuming energy drinks. These beverages contain more sugar than an average soda and can wreck havoc on the blood sugar of a diabetic. Consuming too many energy drinks over a long period of time may even increase an individual’s risk of developing type 2 diabetes. Energy drinks may be particularly dangerous for patients with a preexisting behavioral condition such as attention deficit disorder or attention deficit hyperactivity disorder. The caffeine and sugar in energy drinks cause drastic swings from excitable and energized to being exhausted. These highs and lows can be particularly difficult for an individual who is already struggling with mood or behavioral problems. Individuals who consume energy drinks on a regular basis may become dependant on the boost from the caffeine. 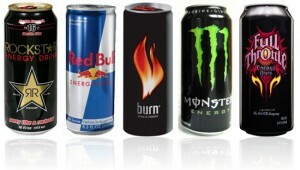 These users often experience withdrawal if they stop consuming the energy drinks abruptly. Withdrawal symptoms include headaches, nausea, dizziness and vomiting. To minimize energy drink side effects associated with withdrawal, work your way off of the caffeine gradually rather than all at once. Energy drink side effects can be extreme for individuals who are not careful with their consumption. Most doctors advise that children and teenagers avoid energy drinks altogether. In extreme cases, consuming too many energy drinks may even result in death, especially if the drinks are mixed with alcohol or other medications. Always exercise caution with this type of beverage.